In keeping with the motto of “Waste not, want not”, the University of Toronto Scarborough has hired a Sustainability Coordinator. Tim Lang took office on May 7, and says he is pleased to hold the inaugural position. He looks forward to working with others to help make the campus more environment-friendly. Lang has just completed his Master’s degree in Civil/Environmental Engineering at the University of Toronto. 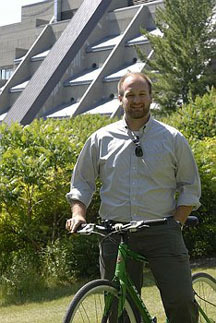 Previously he worked for the University of Toronto Sustainability Office on the St. George campus, and maintains a connection and network there. Together, the team will be examining and coordinating some tri-campus initiatives and larger sustainability projects that the university may study and implement in the future. Some specific projects that may be pursued are as follows: replacing incandescent light bulbs with compact fluorescents, upgrading in-ceiling fluorescent lights, installing devices to cut power consumption on refrigerated pop machines, a campus greenhouse gas inventory, low-impact de-icing solutions for roads and walkways, organic waste diversion, waste reduction, conversion of campus police vehicles to liquid propane, energy efficient building retrofits, procurement and purchasing initiatives including increased use of recycled paper products and purchasing of local food. The office has also hired an intern, May Quach, a student in the Master of Environmental Science program, for six months. Currently, she is looking at the feasibility of local food purchasing for on campus food services facilities, some of which is happening already. She is also investigating the potential purchase and use of an organic worm waste product that could be used by the grounds crew in landscaping on campus to prevent and reduce plant disease. Donate used clothing and other items instead of throwing them out. "These are just a few of the things people can do to make their activities more sustainable, and they don't require that much effort. People who bring their lunch in a container probably don't think of it as a sustainable practice, but it's a good example of a sustainable approach that can be built into everyday activities." Lang has family ties to the University of Toronto. His father, Dan Lang, is a long-serving professor and administrator at the University of Toronto, and is the coach of the Varsity Blues baseball team, which opened its playing fields on the Scarborough campus last fall. Tim’s mother, Diane Lang, is a math teacher at University of Toronto Schools. His sister, Kate Lang, graduated from the Management Co-op program at U of T Scarborough in 2003. Tim Lang can be reached at (416) 208-2668 or by email at: sustain@utsc.utoronto.ca. His office is located in room 204 in the Management building. For more information on sustainable initiatives on campus, visit the Sustainability Office web site at: www.utsc.utoronto.ca/sustain.